Sterile, disposable, anatomically-shaped medical gloves with the thumb positioned towards the palmer surface of the index finger, as opposed to laying flat; intended for use in surgery or any sterile medical procedure. One pair of slightly-powdered gloves: 1 right-handed, 1 left-handed. Minimum force at break for surgical gloves: before accelerated ageing 10.5N, after accelerated ageing 7.5N. Straight-sleeved with reinforced hem (rolled or ending in a reinforced band). Suppleness: Closely fits the morphology of the hand, minimally impairing the wearers sense of touch. The shape of the glove accurately accommodates the anatomy of the hand; the thumb is offset from the palm and set forward of the index finger. The interior surfaces of the gloves must be finely coated with powder for ease of wearing. The cuff should be long enough to cover adequately the wrist of a surgeon or nurse wearing an operating theatre gown. One (1) pair of sterile surgical gloves, individually peel-packed. Gloves must be supplied with double packaging: an interior layer and a peel-off package. Gloves must be packed: in right- and left-handed pairs, with the sleeves reversed up to the thumb. Labelled with: size, right-hand, left-hand and the position of the sleeves. Indicate: Manufacturers name and address, multilingual product description (English, French and Spanish, others when available), size, "sterile" with sterilization method, lot number, expiry date by year and month, "for single use", and CE mark and reference number of notifying body. 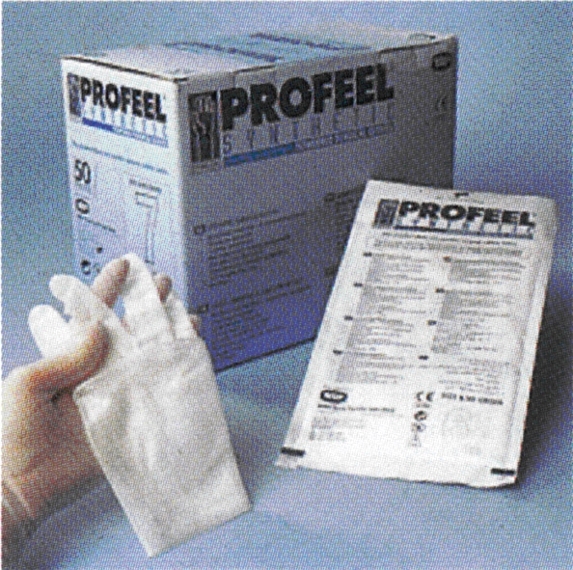 Protected unit, one (1) box of 50 pairs of surgical gloves. Labelling on the secondary packaging: same as primary packaging. Complies with European Medical Device Directive 92/42/EEC or equivalent international norm.